When some massive stars, at the end of their lives, explode as Types Ib, Ic or II supernovae, they quite often experience subsequent gravitational collapse, becoming a white dwarf. This, however, only applies if the mass remaining after the supernovae is less than 1.44 solar masses (the Chandrasekhar limit). For star remnants with mass greater than this, a neutron star is the result. The extra mass makes the gravitational collapse continue past the white dwarf stage, so that the object's individual protons and electrons are squashed together until they fuse to become neutrons - hence the star's name. The upper limit of mass is critical, too. More than 10 solar masses would cause a gravitational collapse powerful enough to pass even this phase, culminating in a black hole. Here we see a neutron star superimposed on a satellite view of Earth. This shows just how tiny these things are. They can be as small as six miles in diameter and would appear bluish-white to the naked eye. Don't let their size fool you, though. Into that small volume is packed an amount of mass equivalent to several times that of our Sun. The gravity on its surface would be some two billion times stronger than Earth's and a one inch cube of it would weigh around one billion tons. So, we've seen that neutron stars are unbelievably tiny and extremely massive, but they also display blisteringly high temperatures. The surface of one of these things can be anything from 600,000 to 5 billion degrees Kelvin. The interior of a newly formed one is thought to possibly be as high as one billion Kelvin, but, due to the amount of energy the star gives off in the form of neutrinos, this drops very quickly to around one million. These tiny objects also spin very rapidly. Up to 2006, the fastest spin ever recorded was 642 times per second. Then, in that year, one was observed with a spin rate of 716 times per second. This object, christened rather picturesquely, PSR J1748-244ad, has an equator that is moving at one quarter the speed of light. 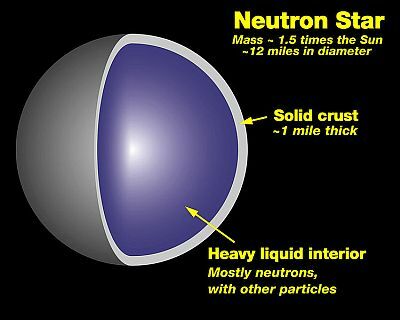 As you can imagine, what's inside a neutron star can only be conjecture. It is thought that it has a solid surface, probably comprised of iron nuclei which have been forced into a lattice formation by the powerful gravity. Below this crust, there is possibly a mixture of ordinary nuclei and neutrons. The nearer to the core you go, the ratio of these two particles changes in favour of the neutrons. In the graphic above, it states that the form these particles take is "heavy liquid". It has been postulated by some that it is actually a superfluid. Neutron stars tend to have very strong magnetic fields - some can be a trillion times more powerful than Earth's. This, together with the fast spin of the star, causes beams of electromagnetic radiation to shoot off into space from both its north and south magnetic poles. As these poles are usually offset slightly from the object's actual axis of rotation, the effect is like that of a lighthouse beam, sweeping the sky. When we have a neutron star whose electromagnetic emissions are aligned so they take in planet Earth, allowing us to see the signal which, to us, would seem to be blinking on and off, the object is then named a pulsar (short for "pulsating star"). The first pulsar was discovered in 1967 and was observed to be emitting pulses, extremely accurately, every 1.33 seconds. Because of this accuracy, it was thought that it might be a signal from intelligent extraterrestrials. Thus, it was initially christened "LGM-1", the letters standing for "little green men". As further pulsars were subsequently discovered all over the Galaxy, it began to seem like these pulsating objects were actually naturally occurring phenomena. LGM-1 was quickly renamed. 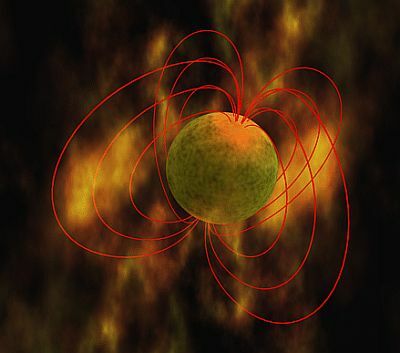 Some neutron stars can have unbelievably powerful magnetic fields - up to one quadrillion times that of Earth's. Such neutron stars are called "magnetars". As the magnetic field slowly decays, it results in violent bursts of lethal X-rays and gamma rays being given off into space. If a sufficiently strong burst were to sweep through our Solar System, it could have serious implications for life on Earth. In fact, our planet has had a narrow escape. In March 1979, we were hit by a gamma ray burst. It caused the radiation detectors on 10 NASA and Soviet satellites to register off the scale. 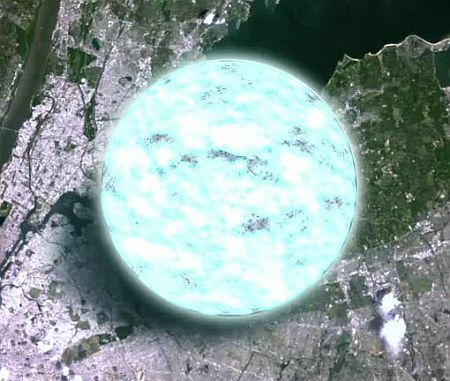 Lasting a mere one-fifths of a second, it contained the energy equivalent to that put out by our Sun in 1,000 years. Luckily, it was too weak to cause any real damage, but one with enough power could cause mass extinctions. This is a theoretical state that certain neutron stars can reach. The theory states that, with sufficient pressure, the neutrons within the star will be squashed together so severely, they will be forced to split into their constituent quarks - in this case up quarks and down quarks. This resulting stuff is called "quark matter" and it could either be confined to the core, or make up the whole star. Further speculation suggests that these stars may be extremely stable and therefore very long-lived. It is possible that some quark stars that might exist today would date from just after the Big Bang. Such objects have been termed "primordial quark stars". Although still theoretical, two neutron stars have been discovered that display strange characteristics, inconsistent with how they would normally behave. They are being considered as possible candidates for quark stars. It doesn't end there. It is not beyond the bounds of possibility that some of the down quarks in a quark star may combine to form strange quarks. The resulting three-quark mixture then constitutes what is termed a "strange star". This is still only a theory and no possible candidates have yet been observed.